In one moment of silence, my Jewish identity was born. In fourth grade I transferred from an almost all-Jewish public school to a Quaker prep school. I have made other big transitions since then. But that move to Mrs. Mitchell's classroom at the Friends School of Baltimore was by far the most traumatic transition of them all. I was painfully shy, sincere, and insecure, a toxic combination for the new eight-year-old on the block. I kept on failing the tests on Greek history, which was the focus of the 4th grade curriculum, so day after day I was forced to stay inside during recess in order to study. This was actually a relief, though, since I was also failing in the playground. One day, the daughter of a judge with an alligator on her shirt came up to me with a group of snickering friends and asked, "Did you get your clothing from a junkyard?" Music class was the worst. In earlier grades, my new classmates had learned a complex system of hand gestures that represented the notes of the songs we sang, but I had never learned these hand gestures in public school. I was always looking at the person next to me, trying to do what everyone else did, trying desperately to just fit in. And then there were the preparations for the annual Christmas concert. I was the only student who did not know the Christmas carols. I was the only student who did not know the Christmas carols. I also found the words confusing. During a rehearsal of "Oh Come All Ye Faithful" I asked our teacher, "Excuse me, Ms. Vidor, what does the word 'Christ' mean?" Ms. Vidor, a devoted member of her church choir, lit up. "Excellent question! The word 'Christ' means the 'the Lord.'" I smiled, "Then why do we sing "Christ, the Lord"? It's silly to say "The Lord, the Lord!" Ms. Vidor gave me a sour look, and did not respond. I was embarrassed. I had been a bad girl. Things started looking up when I began junior high school. I had learned, more or less, to dress like my classmates, to talk like them, to act like them. I was beginning to fit in at long last. It was a dream come true. One snowy December day while waiting for the city bus to the Jewish area of Baltimore, my classmate, Erin, asked me "So, what do you do during the Christmas carols?" "I mean when they sing 'Jesus' and stuff. We're Jews, we can't say that." For all those years, I had never thought about it. It had never occurred to me that I should do anything different than our Christian classmates. But I admired Erin, who later became our student-body president and an Off-Broadway director. The last thing I wanted to do was make waves. But I knew that she was right. So during that year's Christmas concert, when we got to the chorus of "Oh Come All Ye Faithful" I looked towards the alto section and I followed Erin's lead. Right after we sang "Oh come let us adore him" Erin clamped her mouth shut and did not sing "Christ, the Lord." With a racing heart I did the same. For the six years from that concert until my high school graduation, I clamped my mouth shut year after year and never discussed it with anyone. In fact, looking back, I realize that this was probably the most important annual event of my childhood. With this moment of silence I am telling you that somewhere deep down I know that being a Jew is something important. "And I really hope that doesn't mean that I'm a bad girl." I am a person who cries a lot. I cry when I listen to Country and Western songs, when I read the Weddings section in the Sunday Times, when I hear the Israeli national anthem, when I read Aish.com. But nothing makes me cry like my daughter's annual Chanukah play. This year, for the fifth Chanukah in a row, I will watch one of my daughters perform in the Chanukah play at nursery school. This year, my Ma'ayan will stand with all the other four and five-year-olds, wearing a crown shaped like a flame, and singing the same song that they sing every year about driving away the darkness. 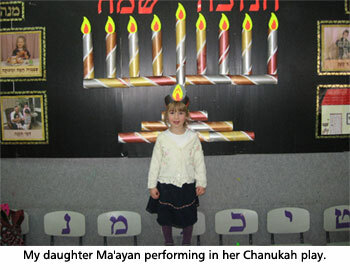 Then Ma'ayan will hold a doll and a prayer book and sing the same song that they sing every year about hiding from the Greeks in the caves in order to live as Jews. I will look around me at the other mothers with their dry eyes and their digital video cameras, and I'll know that when these mothers were children, they were singing these very same songs at their own Chanukah plays. And I will cry because I will remember that Ma'ayan in her crown like a flame is the child of that same girl who was standing on those bleachers singing "Oh Come All Ye Faithful." I will cry because my heart cannot contain the disbelief mixed with thankfulness that I feel when I remember that that girl with her moment of silence became the mother of children who fill the family's Shabbat table with stories from the weekly Torah portion, whose favorite song is "Jerusalem of Gold," who have no idea that Chanukah is not the only holiday that comes in December. But more than anything else, when I see Ma'ayan singing these Chanukah songs at the top of her lungs, I cry because I realize that I am raising a daughter who will never ever have to worry that by being a good Jew she is being a bad girl. Chana Jenny Weisberg is the author of One Baby Step at a Time: 7 Secrets of Jewish Motherhood (Urim) as well as the creator of the popular Jewish Mom Video Series that can be viewed on her website www.JewishMom.com. Jewish Identity: Are You In or Out? Oh there's no place like Haifa for Hanukkah, With the dredle spinning to and fro... I too was in a school that was 99.9% Christian; I was the .1% I simply remained mute while the rest of the class sang Christmas carols. One teacher I had asked me if I thought I was too good to join in. "No, I'm not a Christian." She replied, "Of course you are, everyone is Christian." Talk about being an idiot! I told her that I was the same religion as Jesus. She thought that Jesus was a Christian! She had never knowingly met a Jew, nor did she have an inkling that Jews were NOT Christians. Fortunately my school's principal was a wonderful woman who knew what Judaism was. The next day I brought a menorah to school and although I couldn't light the candles, I set up the candles to count the days of Hanukkah. My teacher ordered me to remove "that thing" from my desk, I told her that as soon as all the pagan decorations were taken down, I'd remove my menorah. So it was back to the principal who gave me a hug and confided in me that she couldn't stand that teacher either and she congratulated me for having chutzpah. And Jenny (my grandmother's name) I also love Jerusalem City of Gold. I still shed tears whenever I hear it, it is such a beautiful song. I hope everyone had a wonderful Hanukkah! A proud Jew. Kol Hakavod !! It never occurred to me to actually sing the words. I also was in that position but it never even occurred to me to sing the words... I would have choked. It was just unthinkable. But I'm sure my face was flushed and my brain was spinning. My children had the same reaction in school though I didn't tell them what to do. I tried to have an impact on the school policies around Christmas and had some success. When my son was in kindergarten and saw everyone in town shopping for presents around Chanukah time he wanted to know if everyone was Jewish. He looked, listened and asked people, strangers, if they were Jewish. After 2 weeks of extensive research he correctly concluded that not many people in town were Jewish. Without realizing it, you made an excellent case for home education! I am so sorry to hear that you were forced away from a Jewish education and into a xtian one. I loved the feeling of your article, I guess because it tells my story too. You were ahead of me, though, I knew I was Jewish, but I didn't even know I wasn't supposed to sing those words. I don't even think I thought about what they meant. In fact, after reading your article, I found myself humming those carols again -- after 40 years! Doesn't matter, we're winners you and I. Don't you sometimes wonder what ever became of Erin, and all those other Jewish kids in school? One more thing, Chana. Tonight's the first night of Chanukah. I live in Jerusalem. I called my parents in the US and had my little girl sing Maoz Tzur over the phone to them. They were kvelling! After we hung up my little girl said to me, "Mommy, I think Grandma was crying when I was singing." Happy Chanukah. So, I am not the only cryer in the world. If it doesn't hurt me, it moves me. And......I wish there waa a nice cave where I could go live Jewishly without being harassed. That would be nice. It would be nicer if I didn't need to make that wish. Happy Hahukkah to you Chana and family. Keep telling your kids, as they grow, of this miracle. I have Ba'al tshuva friends who's rabbis advised them NOT to tell their children they are Ba'aley tshuva. These kids are not stupid. They sense a difference between their parents and the religious FFB Israeli parents of their friends. Rather than have a 'dark secret', without relating any specific 'aveyra' we might have done, we must share our gratitude with our children. This should bring them a sense of warmth and pride, only strengthening their commitment. At least that is what we have found raising our own children. Kol haKavod on your story. Thank you.